I decided that it also fits the Lawnscaping Challenge #11 for a Clean and Simple card. I kept the embellishments to a minimum on this card. Super duper cute! Love it! Thanks for joining us Lawnscaping gals this week! Super sweet card! 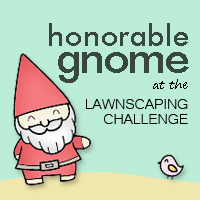 Thanks for playing along with us at the Lawnscaping challenge! This is super cute! The dry embossed background looks great! Adorable! I love the fun colors and the dry embossing, along with the row of three buttons.